Washington, D.C., 2017-Jul-18 — /Travel PR News/ — Accenture Interactive, Marriott International, and 1776 , a leading global incubator and network for startups, today (07/17/2017) announced the launch of the Travel Experience Incubator, a new program designed to discover and foster startups working on innovative technologies and solutions to improve the travel experience. The incubator will bring together the hospitality industry expertise of one of the world’s most innovative companies, Marriott International, and its official Travel Experience Incubator partner, Accenture Interactive, along with participating startups, to co-create unique and inventive new experiences for travelers. More information about the Travel Experience Incubator Challenge, including the related application, is available on the 1776 website, click here. Accenture Interactive, part of Accenture Digital, helps the world’s leading brands transform their customer experiences across the entire customer journey. Through our connected offerings in design, marketing, content and commerce, we create new ways to win in today’s experience-led economy. Accenture Interactive was ranked the world’s largest digital agency in the latest Ad Age Agency Report. To learn more follow us @accentureACTIVE and visit www.accentureinteractive.com. About Marriott International (NASDAQ: MAR) is based in Bethesda, Maryland, USA, and encompasses a portfolio of more than 6,100 properties in 30 leading hotel brands spanning 124 countries and territories. Marriott operates and franchises hotels and licenses vacation ownership resorts all around the world. The company also operates award-winning loyalty programs: Marriott Rewards®, which includes The Ritz-Carlton Rewards®, and Starwood Preferred Guest®. For more information, please visit our website at www.marriott.com, and for the latest company news, visit www.marriottnewscenter.com. In addition, connect with us on Facebook and @MarriottIntl on Twitterand Instagram. 1776 is a public benefit corporation that empowers startup ecosystems around the world to solve complex challenges. To accomplish this, the company leverages its digital startup network, UNION; physical campuses in Washington, D.C., New York City, San Francisco and Dubai; a global startup pitch competition, Challenge Cup; and deep staff expertise in regulatory issues. 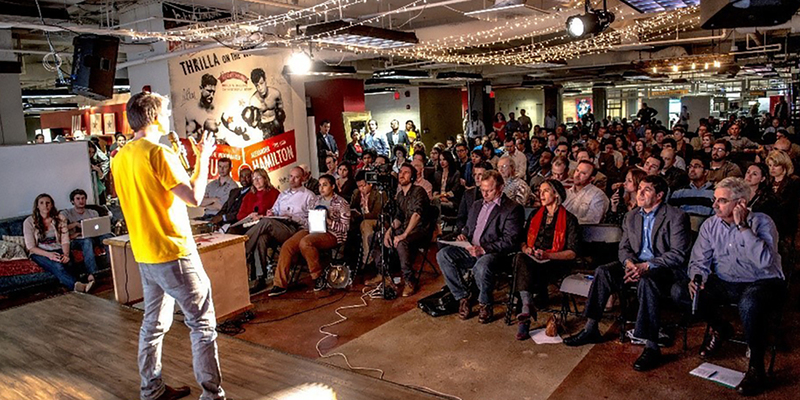 1776 accelerates connections and outcomes among startups, corporations, and public institutions. For more information, please visit www.1776.vc and follow @1776 on Twitterand @1776vc on Instagram. This entry was posted in Business, Festivals and Events, Hotels, Resorts, Travel, Travel Marketing, Travel Tech, Travelers and tagged Evan Burfield, Julie Sweet, solutions travel experience, Stephanie Linnartz, technologies, Travel Experience Incubator. Bookmark the permalink.